The GCT’s most recent acquisition, a 13-acre parcel of land donated by Bob and Sue Lotz, connects surrounding protected parcels, fitting in perfectly to create a larger, protected land resource for wildlife and other natural habitat. On Sunday August 9, a dedication ceremony was held attended by GCT trustees, the Lotz family (Bob and Sue Lotz, their daughter Joy Lang Holmes, and their son, Bryson Lang) as well as honorary GCT member and community leader Marion Stoddart. 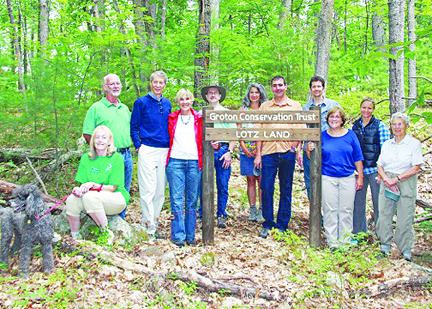 Approximately 25 residents attended the dedication ceremony after walking approximately one-quarter of a mile down a quiet, pine needle and leaf-covered path from Indian Hill Road toward Half Moon Swamp. Bob and Sue Lotz, their children Joy and Bryson are joined by trustees Wendy Good, Bob Pine, Ed McNierney, Susan Hughes, David Pitkin, Holly Estes and honorary trustee Marion Stoddard at the land dedication. Trustee Ed McNierney greeted guests as they arrived for the dedication of the Lotz Land, thanking the Lotz family and noting the remarkable changes that have taken place over the years in this particular area. Nearby, Lotz mentioned that Blackman Land, Bates Land and the Matisse “Bells in the Woods” are within walking distance. Stoddart noted that the adjacent Half Moon Swamp was used extensively by early settlers, donated by Steve Lawrence and family. An important water source, Half Moon Swamp has been documented to exist since the 17th century.